WASHINGTON (AP) — For all the many successes among candidates of color, the midterm elections also proved to some the enduring power of racism, with minority politicians’ intelligence and integrity called into question by their opponents and President Donald Trump in what were widely seen as coded appeals to white voters. “At some point, voters have to stop rewarding racist behavior,” said activist Brittany Packnett. Republican Ron DeSantis, who beat Gillum on Tuesday, began the campaign by cautioning Florida voters not to “monkey this up” by voting for the Democrat — a remark that was also decried as racist. In an often-combative morning-after news conference Wednesday, Trump rejected any suggestion that he emboldened white nationalists recently by describing himself as a “nationalist.” The president repeatedly said the question, posed by a black journalist, was itself racist. 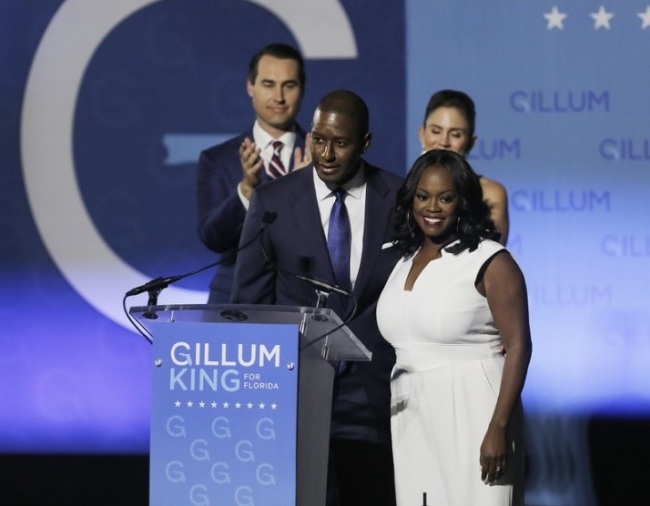 Organizers pointed to the election to Congress of blacks and Latinos such as Massachusetts’ Ayanna Pressley, Connecticut’s Jahana Hayes, New York’s Alexandria Ocasio-Cortez and Texas’ Veronica Escobar, and the passage of a constitutional amendment in Florida that will restore the right to vote to more than a million former felons. They also cited the defeat of GOP conservatives like Wisconsin Gov. Scott Walker and Kansas Gov. Kris Kobach as evidence that coalitions with liberal and centrist whites can work. Likewise, congressional candidates such as Illinois’ Lauren Underwood and New York’s Antonio Delgado showed that blacks can win in majority-white districts. Pressley, elected from a liberal, diverse Boston district as Massachusetts’ first black congresswoman, said candidates of color ignited and expanded the electorate in this year’s midterms. But she said America is not yet at the point where candidates of color are assumed to be capable or experienced. “When we’re characterized as a fad or a trend of a fluke, that’s a disservice to our leadership,” she said.